posts in various departments. Postal Codes of each post are mentioned in the HP Notification. There are total 2945 vacancies available in this HPSSSB Recruitment on contract basis. Eligible candidates may go through Himachal Pradesh SSSB official website http://www.hpsssb.hp.gov.in to apply for current recruitment vacancies. Online HPSSSB web link activates from 16-09-2017. Last date to submit application forms is 31-10-2017. Selection of all posts in HPSSSB Recruitment is based on written test and Interview. For more information regarding HPSSSB Recruitment vacancy details, Post Codes, No of vacancies, Educational Qualifications, Age limits, Application Procedure are mentioned below. HPSSC application submission through online closed on: 31-10-2017 by 11.59 PM. Available vacancies in HP Public Service Commission Recruitment are 2945 posts. Total No of Posts: 2945 posts. See the HPPSC official advertisement for Educational qualifications. Check the HPPSC Notification for Age relaxation details. See the Himachal Pradesh HPSSSB Notification for pay Scale related information. Selection of candidates for HPPSC recruitment vacancies is based on written test and Interview or Skill Tests. For SI posts Physical Tests will be conducted. Check the notification for details selection procedure and exam pattern. Written Test will be conducted for 85 marks. Total 170 objective type Multiple Choice Questions will be given. Each questions will be of ½ marks. Exam duration is 2 hours. The skill tests /physical standard and efficiency test etc will be conducted wherever required. 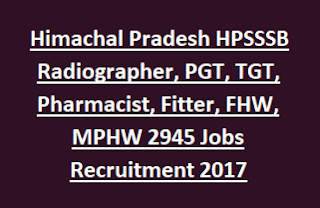 Interested/ qualified candidates may go through HP PSC official web link http://www.hpsssb.hp.gov.in Open the HPPSC Recruitment link and apply for specific post. Before applying read the general instructions. Application forms should be send from 16-09-2017 till 15-10-2017.